A group of people staged a protest at Mahinda Rajapaksa International Airport (MRIA) this morning against the Paddy Marketing Board’s decision to use airport warehouses as a paddy storage space. Police said the protesting residents and airport employees obstructed a lorry carrying paddy, from entering the airport premises. This is the worst thing ever doing by a government. As everyone knows, Hambantota port is in a strategic location in Asia. Singapore tried very hard to not allow to build as it hits their port and business. So they pumped loads of funds to pull down, still some of our guys are working on those. If there’s a port, it’s a high requirement to have a airport as well. This is for further transportation. 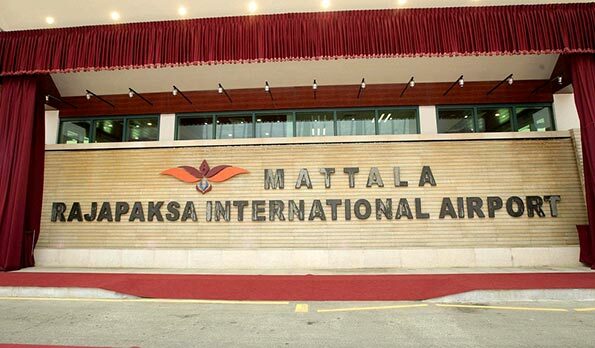 Also we should know that Mattala also build in a very strategic location, in line with a direct flight route which airlines used to fly. This is the reason we heard that, many politicians said that even if any plane fly above will pay to it. So it earns without any landings, how good is that. Secondly, we as a small country have to have another airport to the country, for tourism and to ease congested matters at main airport. Also domestic travels highly required now, if we plan for local domestic airlines to move around and do business using industrial zones. Hambantota is built for industrial zone, so as any government should use it effectively. Knowing all those facts, I’m very sad to hear that they are trying to waste people money which invested on this. If current government is capable, they should be able to get it used by talking to airlines to land there by allowing tax reliefs. Also allow southern people to land there without landing at BIA. It will be very convenient. I heard once RW said, he will use this as export hub for fruits. Is it only an election promise and gone in the wind? Use this airport without making whole world laugh at us. Many are waiting to shut this down and gain business. When tourism boomed in SL, it affected to Kerala, So they are trying to overcome by having agreements with us. And doing many things. Do we not know what we have and fall into the ditches? This is revenge. In the future this government will destroy more projects which was done by MR. It is obvious, that the present government wanted to insult MR, by saying that the Mattala airport can be only used as a store room. Current governments lack of wisdom and foresight , high stupidity and great foolishness as well as desire and priority for personal vendetta than on development are on big display here. The whole world must be laughing at us on this issue. Prominent hambantota is fame for salt, I wonder why for paddy?